That made all the difference. He not only met his future bandmates there—bassist Zach Sutton, drummer Whistler Allen and operatic vocalist Jake Luppen—but he forged a truly idiosyncratic sound that’s brainy, bratty and occasionally barnstorming. You could describe it as Vampire Weekend meets Wild Beasts on the retro-cheesy film set of some classic John Hughes flick like Sixteen Candles or Pretty in Pink. Following two EPs in 2014 and ‘15, the quartet’s dazzling debut LP, Landmark, is delightfully effervescent. 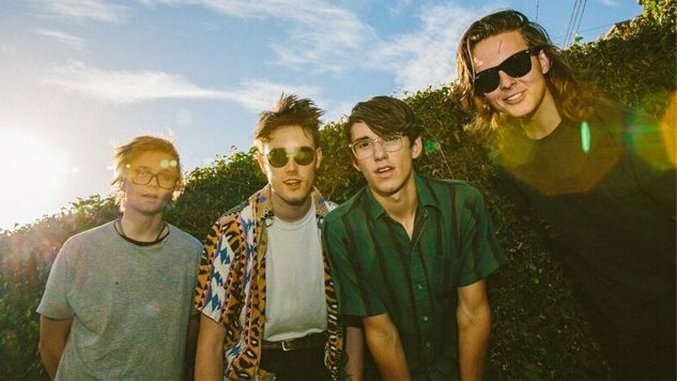 It jumps from the jangly skip of opener “Way It Goes” to chirping falsetto in “Vines” to the experimental hip-hop nursery rhyme of a closer, “Buttercup.” After naming the band the Best of What’s Next in 2015, we checked in with members of Hippo Campus more recently to talk about Landmark and more. Paste: You guys have already developed a bigger following in Britain, right? Nathan Stocker: Yeah. And we didn’t really know it was happening. It’s been weird and really hard to judge what was going on over there this last trip around. We just got back a few days ago, and having a bunch of sold out shows there for us was like, “Wow! This is great!” Everybody was into us. The first time we were there was in 2015, and I think it was with Walk the Moon, so that was kind of the start of it all. Then we did Reading and Leeds, and we had been on the road for three months at that point. So it was a bunch of new experiences all at once—it was great. Paste: How did you get added to the Leeds and Reading Festival bills? What was that like? Stocker: It was pretty incredible because we got to hang out with this band that we ended up touring with last winter called Little Comets, and we got to know them a little bit backstage. They’re from Newcastle. But it was also fucked up, because we were walking across the yard with this huge sea of people, with everybody getting muddy. And there was a bunch of people just urinating in the middle of it all, wherever they were standing…But playing was fun. The crowd was really tight, and that was our first experience with people actually singing along to our guitar, just going, “Dah-DAH-dah-dum!” And that’s never really been a thing over here in the States. Not as far as we’ve encountered. Paste: You sound like you could be an Oxford-educated British band. Stocker: Sure. I get that. And we had a bunch of influences from British bands in the beginning, like Little Comets. They’re dope. They’re just awesome. And bands like Bombay Bicycle Club and WU LYF, they were a really big influence on us in the beginning, especially concept-wise, in terms of making a brand instead of a band. So at the time, that was the jump start for us to start making music. And obviously, our individual inspirations and influences are much more diversified across the board. But those were the groups that gave us a kick start. Paste: What brought you and Jake together at your own posh academic institution, the Saint Paul Conservatory for Performing Artists? Stocker: Well, three of us were in the music program, and Jake was in the vocal one—he was actually doing opera and learning how to sing well. Well, he already knew how to sing well, but he was just perfecting his voice. And the three of us, we all kind of dabbled in jazz and classical music. But what we were most interested in was starting a band and making our own thing happen. And most of those kids we met there, that friend group, we still have back at home, and we’re always collaborating. Like our buddy David, who does all our design – we knew him from school. He does all the visuals on our Instagram, and he did the album cover, which is a recreation of our original practice space, where we wrote everything we’ve written up to now. And there’s another band here called The Happy Children, and we’re really tight with them. So it’s like one big family, a family affair. Paste: Beneath its bright candy shell, songs like “Vines” on this album discusses dark stuff, like getting through another night and waking up with everyone leaving you. How do you balance that? Stocker: That song is about those nights when you come back home, and everybody is like, “Let’s get together and let’s do things!” And hopefully, it actually happens. But usually, it’s rare if it actually occurs. Thankfully, we’ve been able to maintain a good friend group, and “Vines” is about those night we come back and we’re catching up, maybe getting a little too drunk, with the knowledge that in the morning, everybody could be gone. So it’s about savoring those moments, knowing that it could all be gone the next morning. We wrote that song on the tail end of the record. It’s not even six months old. Paste: What about the song “Tuesday?” It sounds quite whimsical, but the protagonist is drinking wine from a box. Stocker: Yeah. By yourself. And in your mom’s basement. Jake wrote that, and I think it was a post-breakup thing. And that’s one of the more accessible concepts or themes on the record. Paste: Ok, and finally, why the odd moniker?